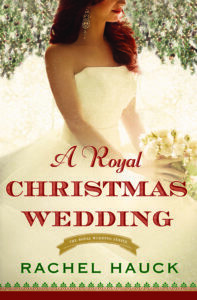 Heart-stirring, page-turning Christmas fairytale. This gem made me want to curl up in front of a roaring fireplace with hot chocolate in hand, and some light Christmas music playing in the background. Reality--I read it in the minutes between chattering children bickering over toys, but it still had the power to melt my heart and keep my mind glued to its pages. I couldn’t get enough of this book--to the point that I now want to read the first three books in the series! This modern day fairytale with American girls who become princesses, is written by one of my favorite authors. I I most highly recommend reading a book by Rachel Hauck, if you have not done so already. What better series to start with than a royal wedding series? Especially with Christmas quickly approaching. I might be a little biased when it comes to contemporary Christian romance--as it is my favorite genre but I’d easily give this book five stars. Avery and Colin are both likable, believable, relatable characters with a history together. Avery is still nursing a broken heart from nearly five years previous and Colin can’t forget the American girl he fell in love with. Add to the mix, a unique tale of the Pembroke Chapel Bell, God working in their hearts and lives, and a romance that makes you swoon--and you have an unforgettable Christmas novel.